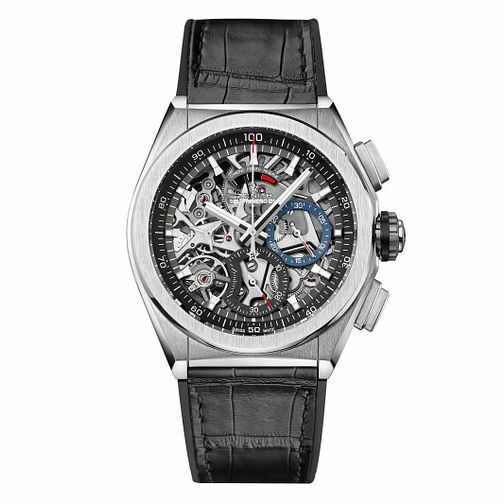 Zenith presents a meticulously crafted piece from the El Primero series, with a skeletonised dial that showcases the amount of craftsmanship and precision needed to craft the piece. The dial features stainless steel indices with brushed detailing, five second increments around the circumference of the dial and a date aperture marked with red at the 6 o'clock mark for added efficiency. Two separate subdials are included with the skeletonised dial revealing the insides of the watch, letting you watch the movements internally. Swiss made for decades of precision in the art of watchmaking.